I found Torwoodlee Golf Club through James Braid. 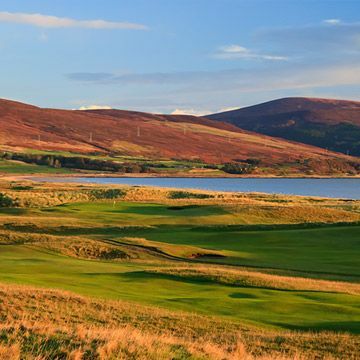 When I first came up with idea to challenge myself to play 50 rounds of golf this year, I thought I would play only James Braid Courses. 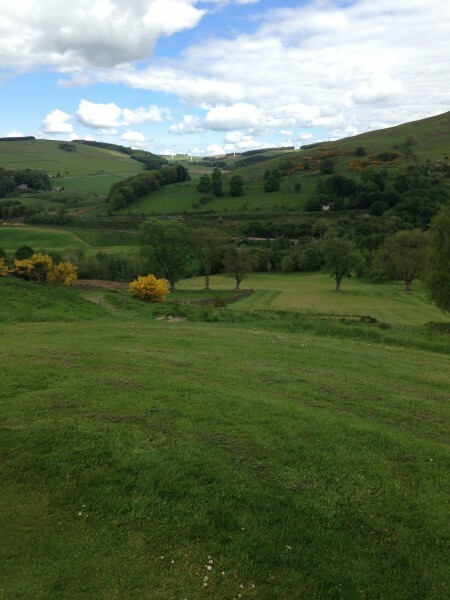 Torwoodlee in the Scottish Borders was one of the first on the list. But as I did more research, I realised that I really wanted to play other courses as well, not just those designed by Braid. But despite the change, Torwoodlee remained firmly in my sights and I am glad it did. Mr. Braid stamped his indelible footprint on this course back in 1895. 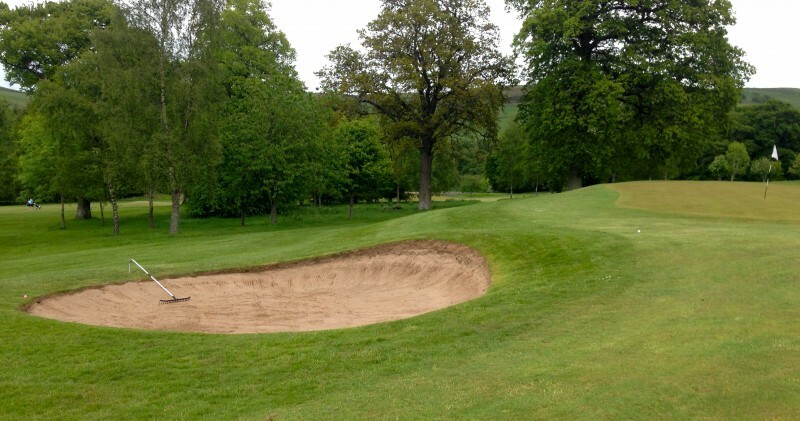 It is nestled on the banks of the River Gala two miles past Galashiels on the road to Edinburgh. 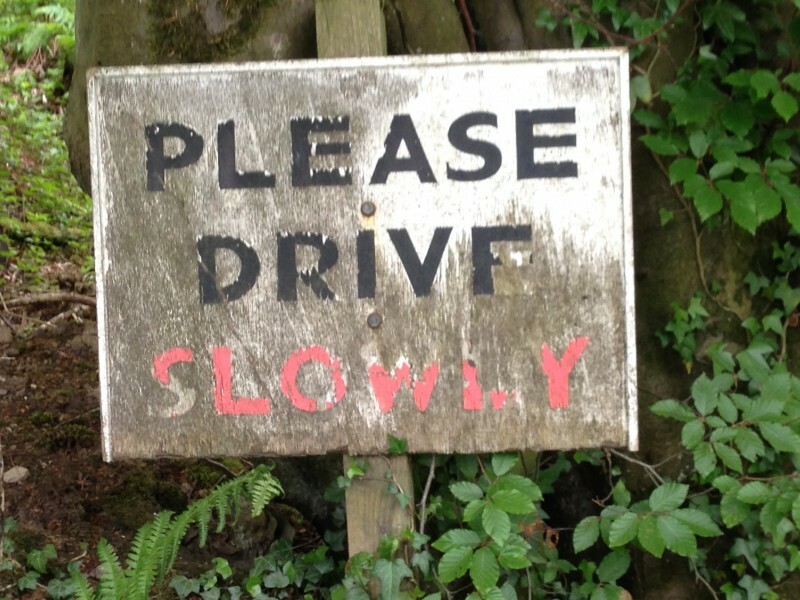 It is well sign posted, easy to find and it is certainly worth the visit. I called in advance and tentatively booked a tee time at 9:30. I was told the tee was free until 10, so ’not too worry.’ I should have known that that was the sign to worry! But I did not. So thinking I had plenty of time we set off at 8:40 from Peebles to get to the course. But as you can imagine, we got stuck behind a slow car, then a lorrie and finally a school bus as we struggled to get there. Recalling the infamous words of e e cummings, 'Nobody beautiful ever hurries' I turned off the A7 at 9:25. The gentleman in the office was extremely helpful and even though we were a few minutes late, he encouraged us onto the tee following some members and infront of a small group visitors. We were a bit dubious. But it was such a lovely morning, we decided to give it a go. We were certainly delighted that we had! 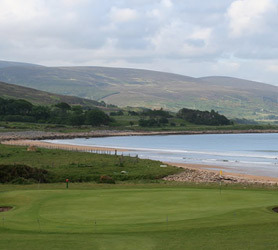 Torwoodlee is a beautiful course offering amazing vistas over the countryside. 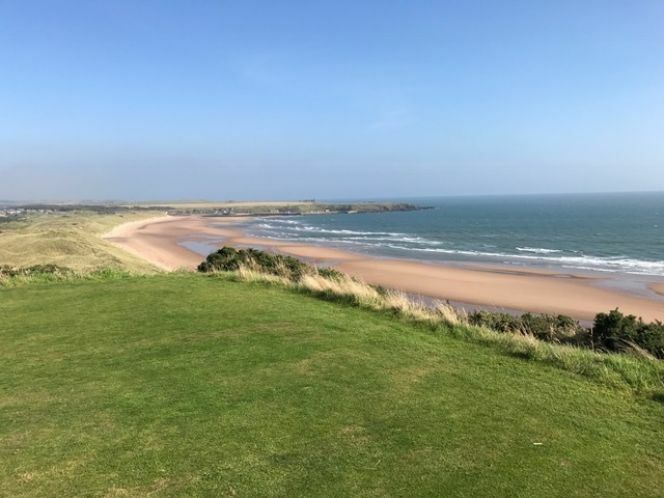 It has classic Braid components of greens protected by several bunkers, mounded protrusions 100 yards from the green and undulating fairways to send your ball in unsuspecting directions. It begins near the clubhouse, but then extends past the new railway lines into an enchanted ten hole loop on the adjacent hillside. And I am delighted to say at the first tee, it is clearly signed with Ladies given priorities on Thursdays. 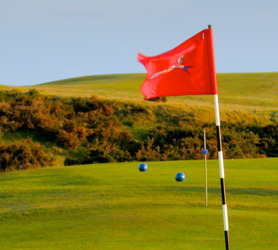 The course begins with three holes, before crossing over the railway lines to a ten hole loop nestled in the hillside. It's on this ten holes that the real fun begins! My favourite was the 6th, pictured here. One of the most picturesque holes on the course, this superb par four dog leggs left offering a shot straight downhill feeding to a small green. There was no wind and my putting let me down but I managed a happy bogey. The 7th is a short par 3, classic Braid, protected by some wicked bunkers. I typically found the one on the left and went up the fairway resigned to my fate. Dismayed when I got there to find my ball buried quite soundly in the sand, I was pleasantly surprised when I picked up the rake. They are really easy to use and make raking fun. I almost wanted to go in more bunkers so that I could use them - almost! I have never seen this style on any of the courses I have played to date. 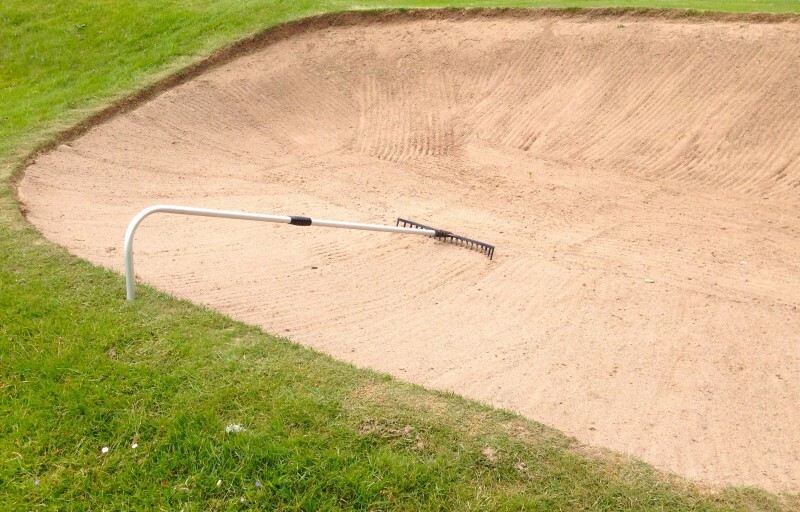 But now I understood why they had such pristinely raked bunkers. I am going to have to speak to Brora's secretary, Tony Gill, about acquiring some for our course. 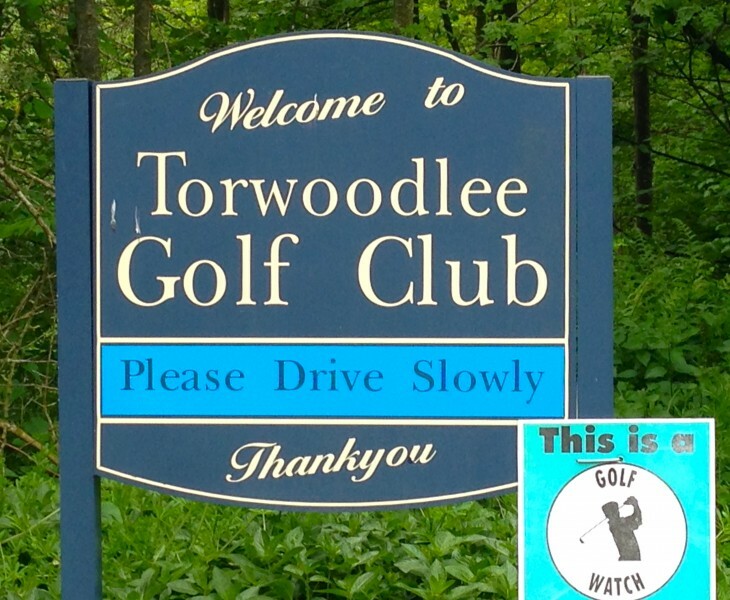 Torwoodlee has many great features (besides its rakes!) and another struck a chord. 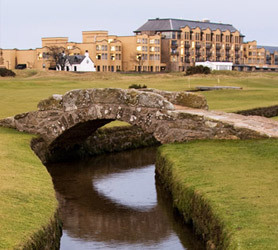 It has two double greens like the Old Course St. Andrews. They are the 1st & 15th and the 9th & 13th. 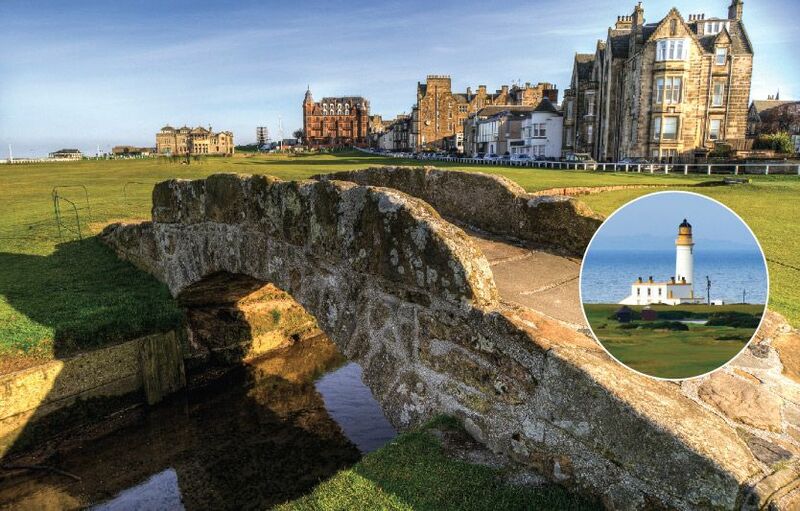 While they are not as large as those on the Old Course, depending on the pin placement, it certainly adds a extra dimension of complication to the holes. We didn't meet any groups on the double greens. But on a busy morning, it is plausible that one might do so and it could make for some interesting putting at such close quarters! To finish Torwoodlee, one heads back over the soon to be running Borders Railway line. This will re-connect the Borders to Edinburgh (and thus the rest of Scotland) by rail from September. It actually appears that it is going to open on time. It should be a real boost for the Borders economy and inhabitants. 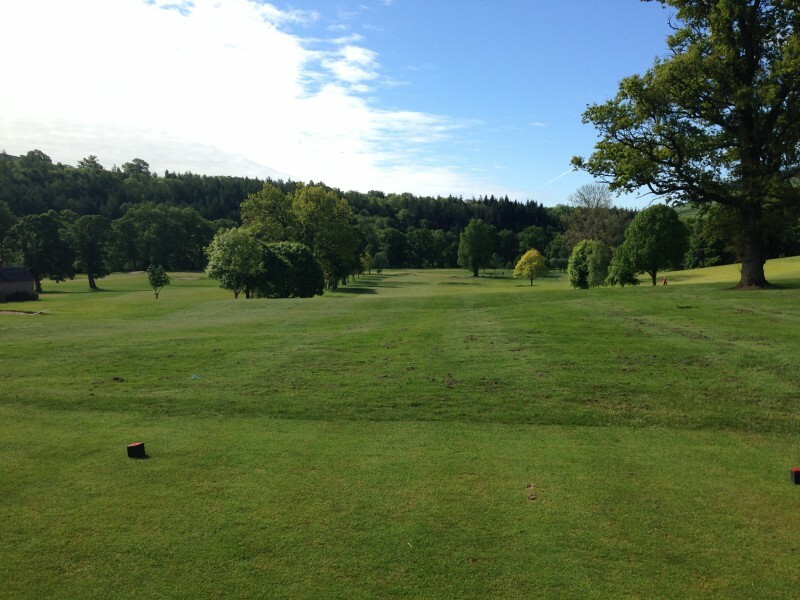 James Braid finished his design of Torwoodlee with some long holes. None tougher than the 16th which comes straight up the hill past the clubhouse. Both Ann and I hit tenuous shots thinking it was well possible to hit the clubhouse itself, if not unsuspecting bystanders. I overcompensated and swung off the the left. When we were finishing our round and were enjoying a lovely cup of coffee, I was about to ask if anyone had ever hit the clubhouse. Then I noticed the crack in the main window. Clearly, someone already had! Here is the proof below. Both Ann and I found ourselves way too close to too many trees on the course. And since I had the camera there are only shots of her as you see below! But we finished up strong and were delighted with our rounds. Nothing that would get us into The Open, but certainly we are improving! Again, they were very welcoming in the Clubhouse and the coffee is terrific - which is high praise from a Seattle girl. 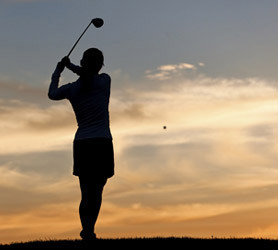 There are approximately 43 playing lady members at the club. And the woman in the clubhouse told us that they are trying very hard to get more juniors playing golf (it seems it is a worldwide problem). But they have come up with a wonderfully innovative programme at Torwoodlee: they invite not only juniors, but juniors and the mums to come! 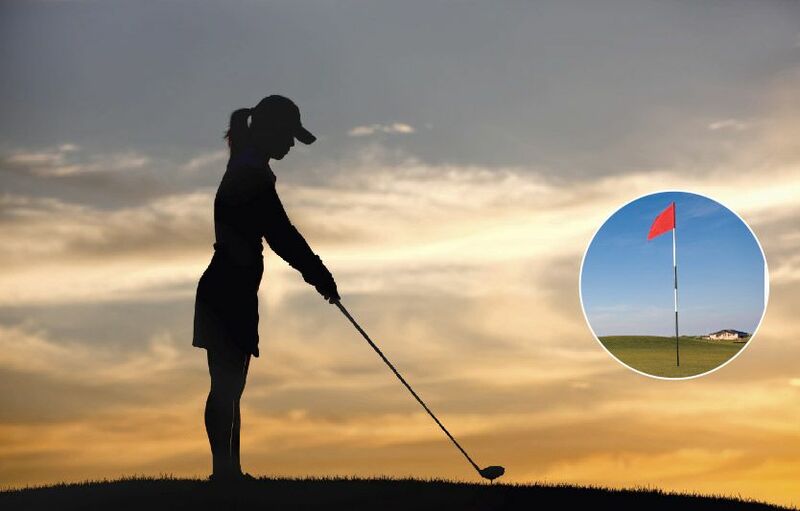 And as she put it, ‘have some fun and swing a club with your mum.‘ They provide the clubs if you don’t have your own and it's proving a great way to get some new interest in the game of golf. In summary, Torwordlee offers one a good challenge and a great day out. There are plenty of golf buggies and pull trolleys to hire. Or you could just do what this lady does: toss your clubs on your back, walk briskly, but DRIVE SLOWLY whilst enjoying your round. Thank you, Torwoodlee, you have changed my game for the better!! 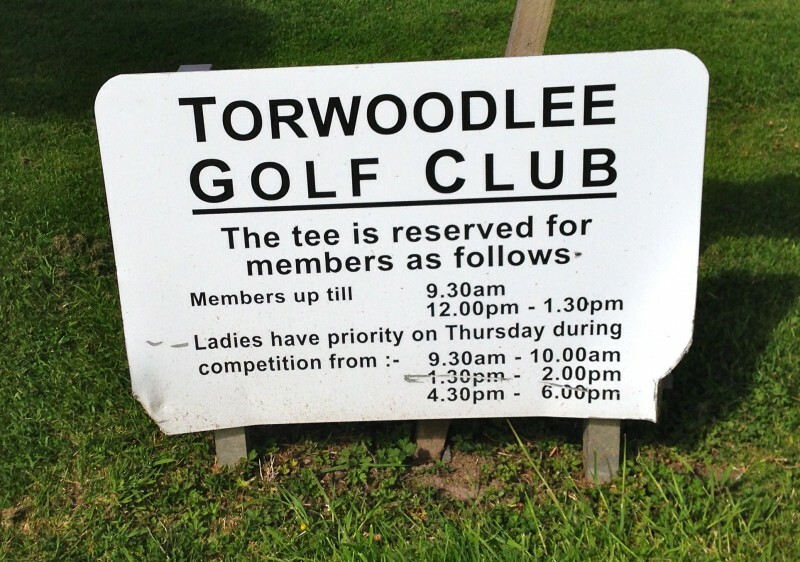 Footnote: Torwoodlee is 5366 for Ladies with a par 72. It is a hilly course with many uphill climbs, but the views and the downhill holes are amazing.